Highly recommended product. Totally a great addition to my dining room collection and it is a space saver. I would definitely purchase again in a hesrtbeat! 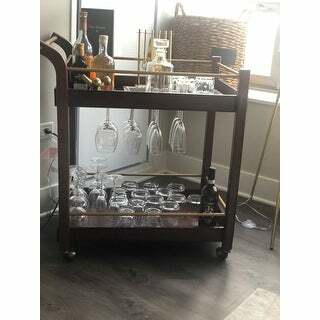 Perfect for your next dinner party or evening soiree, this chic and sophisticated wood bar cart is sure to impress guests. 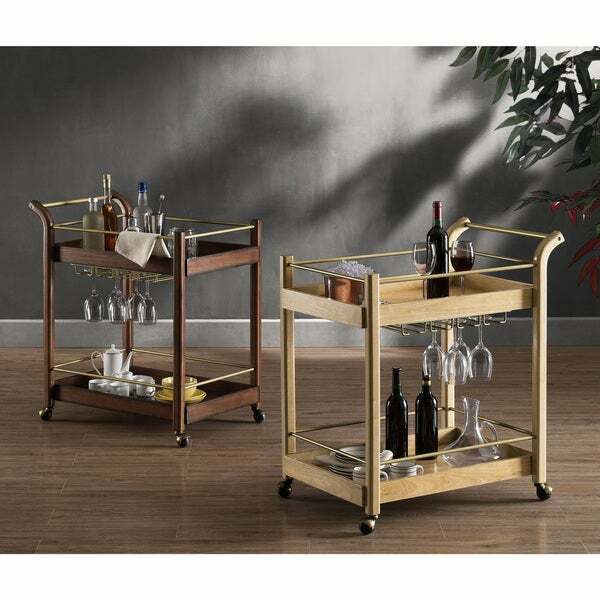 Available in a lovely chestnut or natural finish, the cart features two tiers for storing drinks, while the built-in glassware holder perfectly secures your stemware. The wheels offer convenient mobility for formal party or impromptu cocktail hour alike. Nice Cart... a PAIN to put together. The cart looks very nice. Was creating a whiskey room for my husband with a mid-century vibe, and this ending up being a perfect fit. I didn't give it 5 stars because putting the thing together was probably the most frustrating assembly experience I've ever had. I think it's probably just "by chance" if you end up receiving parts that don't properly fit. For me, on two of the legs, the depth of the holes was not deep enough to accommodate the wheels... which is kind of a big deal, (as an uneven bar cart is problematic). I ended up having to use a drill to modify the depth and get the wheels all the way in, which was a precarious situation, as I don't fully trust myself with power tools. You can technically assemble it with just one person, but for the sake of your sanity... you should have two. But, since the room was a surprise for my husband, I didn't have the luxury of four hands, so.. lost a bit of my sanity in the process. Overall, I've been very happy with the product and my husband loved it. If I hadn't of received defective parts, it'd be a 5-star experience. For the price,compared to others I looked at, it's very nice. If you don't mind (the possibility) of an assembly challenge, then I recommend it. 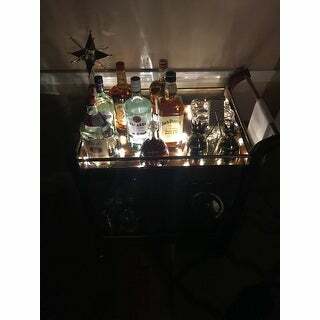 This bar cart was just what I was looking for in the living room. It was easy to put together just follow the directions. The wood and golden finishes were as described. I would recommend the purchase. 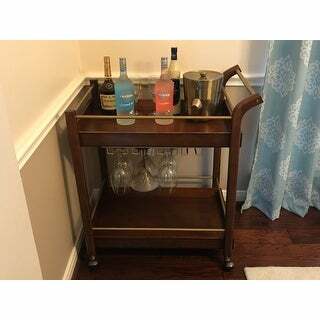 The majority of the reviews that I read before purchasing this Bar Cart, were right on. No MDF, on this cart. Very attractive. I thought it was rather easy to assemble. I must say that the packaging is very well thought out. My box got the usual rough treatment from the delivery company, and I even took several pictures of it prior to opening the box so in case there was any damage I could show Overstock how I received it. It truly is a sturdy piece of furniture, even if it might be a little on the big side. Its nice to get something that not only looks good on the screen, but is actually as nice as it is depicted. You won't go wrong on this one. I will say one thing that I was not overly fond of, and that was the price fluctuations of this cart. The first time I looked at it it was one price. Then when I came back to revisit the site, it was a higher price, but there was a discount coupon available. When I did finally make the purchase the higher price less the coupon, gave me the cart for a better price than the original amount. I am just not a fan of that type of marketing. I would strongly recommend this particular cart, and would purchase it again from this same supplier. 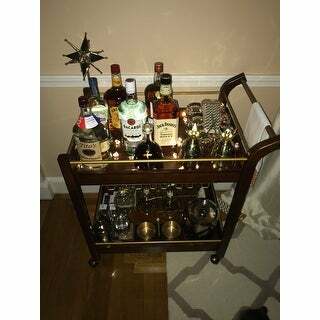 Thanks again to all those who submitted a positive review, because I now have a great bar cart. Love this cart. Easy to assemble. Great quality. Very pleased. 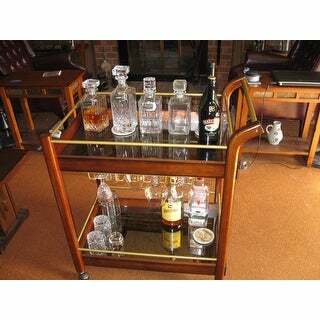 This is a nice bar cart. I purchased this in the darker wood after my friend purchased the same one and it looks great as an accent in my family room. Assembly was fairly easy. Would recommend this! Looks great! I'm really happy with this purchase and how easy it was to assemble the cart. I'm deducting a star because one of the glassware holder screw holes is misaligned and one of the wheels doesn't secure fully. It would be nice to have locks on the wheels to prevent the cart from moving once in position, but otherwise, the cart is worth the money. 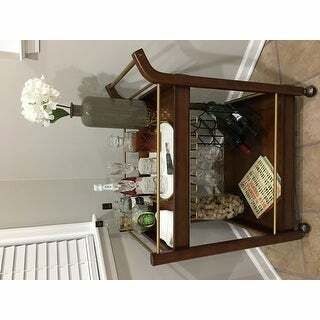 This bar cart is absolutely stunning! It’s even more exquisite in person. The quality is excellent. The dark wood color is gorgeous. The gold tone is a beautiful muted gold, not too shiny. And to top it off, it is incredibly easy to put together!! 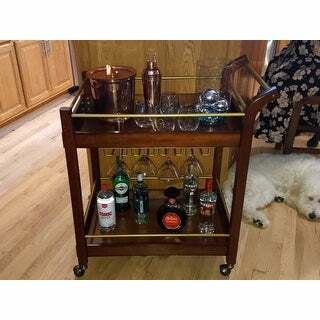 I highly recommend this bar cart! I purchased as a gift for my husband. We loved it. It looks so cool and the quality is good. I will recommend this product. 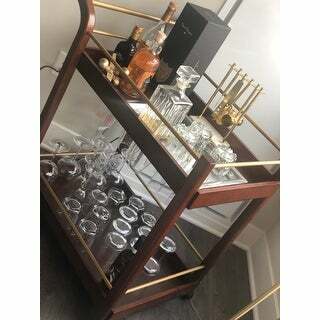 I was hesitant to order this bar cart after reading some of the reviews but I loved the style so much that I ordered it anyways. So glad that I did. It looks awesome, is very sturdy and was fairly easy to put together. You just have to follow the directions and leave the bolts loose until the directions say to tighten everything. The directions even give you a number to call if you are missing any parts or having any problems! 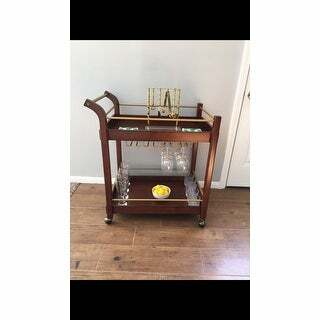 I've already used it as both a bar cart and to serve dessert and coffee to some of my friends. Well worth the money! The price was too good to be true.This piece looks awesome in person but while we were assembling the cart, one of the screws would not fit in the hole of the leg. All of the holes are ribbed for the screws, except one was completely smooth on the inside so the screw would not stay in place. Really weird; it's not something you can fix yourself. We will have to return this piece or deal with customer service and somehow get a new leg or cart ordered. Again, love the look, but the chances of receiving a defective piece are high. I guess that's why people pay more for nice furniture. 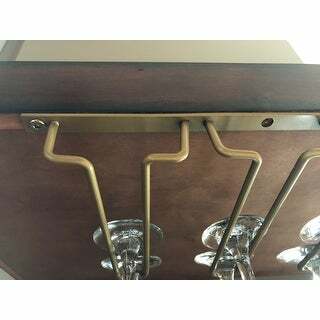 I ordered this bar and the price was so great I was able to spend the same amount of the supplies to stock it ;) Very good quality and was fairly easy to assemble. Well worth the purchase. I was nervous that the assembly on this item would be difficult based on another review, but it was a breeze! Looks expensive and built to last. Very functional! Decent value and it was fairly easy to put together, actually did it myself in about an hour. Looks very nice and fits any where, also matches my livingroom furniture. You cannot beat the look for the price. 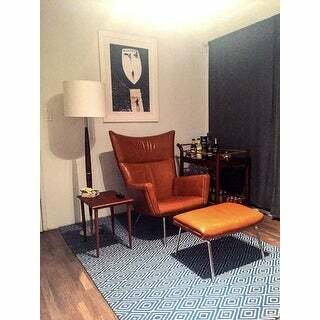 I absolutely love the walnut and gold, and it goes perfectly in our mid-century living room. That being said, it's a bit wobbly, and I wouldn't go rolling it around very much. It's best kept in one place. Looks even better in person! I am so pleased and can’t wait to finish decorating it. It is a very beautiful cart. (1) mahogany color (2) well packed (3) easy to assemble (4) very sturdy It was my gift to my husband. It is very pratical since we can keep our wine glasses as well. Absolutely adore this cart! Easy to assemble, very well made and perfect for what I wanted! 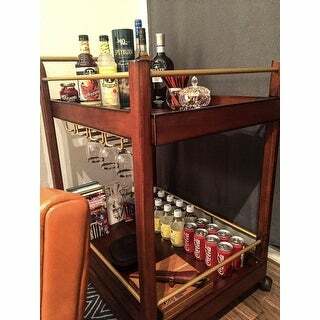 This bar cart is so amazing! I was looking for a similar one that I saw at Crate & Barrel, and this one looks just as fabulous. My husband loves! It’s the perfect accent to our apartment space. "Could you install a wine rack instead of glasses?" 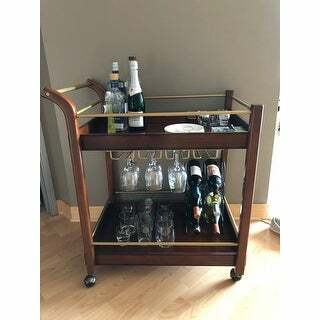 We do not offer a wine rack option with this cart. "when will this bar cart be available in the dark wood?" We do not know when the chestnut will be restocked. "I'm wondering what "natural finish"means. You show the cart in a.blond wood and a darkerwood. Which is it? Thanks"
The light finish would be natural. "Are the wheels made of rubber or metal? I am worried about scratching on my wood floors." The coasters are hard plastic. "so we have two questions on if the wheels lock - one answer says yes and the other no - which is it?" I am so sorry it was a gift for my son - I will text him and ask. "I just received my cart but it comes without a manual of instructions. Do you know how I can get them?. Thanks." 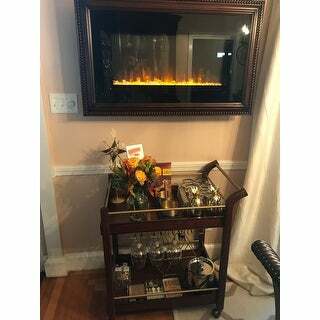 "I received this cart, put it together very easily, and it is beautiful! It is exactly as pictured - even prettier. My question is about the wheels. How do you get them to lock and unlock?" The wheels on this bar cart do not lock.